Creatures resembling opaque pickles have invaded Pacific coastal waters from Southern California to the Gulf of Alaska this year. 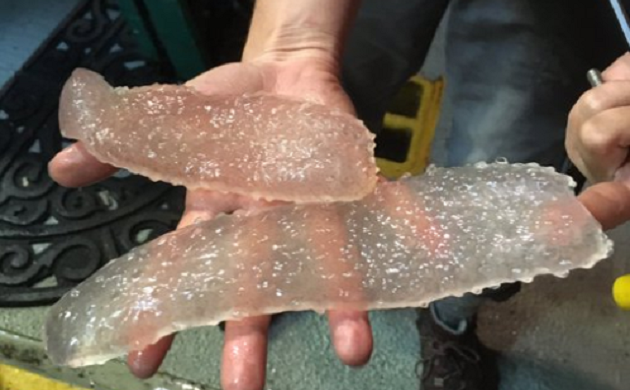 In an atypical occurence, creatures resembling opaque pickles have invaded Pacific coastal waters from Southern California to the Gulf of Alaska this year, mystifying researchers. These translucent organisms are called pyrosomes and are considered to be part of a colony multi-celled animals known as zooids. They're also known to glow in the dark, a bioluminescent characteristic that gives the organism its scientific name: pyrosoma, Greek for "fire body." According to the experts pyrosomes are found all over the world, typically in warmer tropical waters far offshore. Ric Brodeur, a research biologist at the NOAA’s Northwest Fisheries Science Center in Newport, Ore., stated that beachcombers in Oregon have been walking the beaches there for decades, but he has started getting reports of pyrosomes washing up on the beaches only in the past few months. He has also been going to sea on research cruises since the 1980s and saw his first pyrosome only in 2014. He believes the high abundance is related to unusually warm ocean conditions along the coast that resembles pyrosomes' normal habitat. Research is still on to study the long-term implications of these creatures in the food web.